Welcome to the tutorial that was never meant to be! The 13th Tutorial, by popular request, on world building. If you’ve played along with our tutorial so far you may be itching to try out making your own world and finding a new place to build your next dwarfy citadel (perfectly laid out – as detailed on the notepaper you doodled on at work all day). Well, you’re in luck, because that’s what we’re talking about today! A tutorial on custom party settings (organising what your dwarfs embark with) will come some time after this one, scout’s honour. World building is a subtle and arcane art in Dwarf Fortress. You can do it the easy way (default world generation), the slightly complex way (custom parameter setting) or the really hard way (world gen file manipulation). We’re going to be covering just the first way as the others make my brain hurt and I’m not a damn masochist! If you are interested in doing things the hard way you can head over to the wiki and check out the guides to advanced world generation and pre-generated worlds. Me, I got confused reading those so when I wanted something tricky done chose to whine on the Bay12 forums until someone helped me! Thanks forum geeks! Er, where was I, perhaps I should answer the question in my title there! Why do we want to generate our own worlds? Well, generally it is because we want to create a specific type of environment (haunted glaciers with skeletal whales FTW!) or we want to make sure we have an interesting and exciting place to build (build a volcano inside a fortress inside a volcano!). Or perhaps you just want to start a new game in a new land. Fire up Dwarf Fortress and from the start menu scroll down and chose “Create World Now”. At the next screen hit “F9” as instructed and the world will start to generate. You’ll get a lot of stuff happening on the screen as the world is generated. Mountains will form and be eroded, forests will spread, rivers will spawn, civilisations will rise and fall. It’s pretty cool actually! Here’s a shot of the world history being generated, which happens after the geography is formed. Did you know you can actually go and read all of this history in “Legends” mode? Yes, it’s all there! Tons of history and mythology to soak in. We’ll have a look at that later. Once the world is created you’ll end up with a menu as well as a little information, such as the name of your world. Mine, the “Enchanted Plane of Portents” looks mountainous and pretty frozen! Neato! Use the arrow keys to look around and get a rough idea for the kind of world created. Hit “Enter” to accept the world. The world is now being stored and you will be taken back to the main menu. You can now chose “start playing” and a new world will be there, probably the attractively named “Region 2”. With your new region selected, hit “Enter” and you can see the three game modes available. Dwarf Fortress, which you know well by now, Adventurer, which you may have dipped into and Legends. Select Legends with the arrow key and hit enter. After some loading you’ll get a screen showing a list of histories to read. Scroll around, hit enter to drill down and space to go back up a menu layer. The first history I read is about “Angot Torridbrand The Firey Wealths of Heat, a skeletal dragon”. Oh dear! When you’re bored, space back out to the main menu. Play the Damn Game Already! On the right is more information and it relates entirely to what’s in the embark box in the left window. Lets see what we can do about navigating around! Start off by hitting the arrow keys a while. What you’ll notice is that the arrow keys move the X on the region map. Holding down an arrow key results in the local map zipping past, the region map moving square by square and the world map X moving fairly slowly. As you move the cursor around you should see the info on the right change. Note, this info does NOT relate to the region window! Instead, it relates to the local window, but as you’ve noticed by now we don’t seem to have much control over the placement of that local window box… or do we? If you read the text on screen you’ll see you can move the local area box around using “u”, “m”, “k” and “h”. Try it now! You’ll notice lots of information changing on the right. You can also resize the local space using “shift” + “u”, “m”, “k” or “h”. You probably want to leave the box at 4×4, but 5×5 will give you more space when you’re playing. 6×6 should only be used by those who like the game going particularly slowly as those sort of sizes can become somewhat crippling for the CPU to keep up with. 1×1 micro-fortresses are also doable, but check the forums for seeds and ideas. Hit “shift”+”u” and make your space 4×5. Make it small again by “shift”+”m”. Easy huh? But rather than just selecting some random area and hitting “e” for “embark”, lets use the “Find” system to get us a nice site. Hit “f” for “Find”. A new window will pop up with settings to fiddle with. Use the arrow keys to scroll down to temperature and use the left and right arrows to set the temperature to “Medium”. Skip this step if you’re feeling brave! Set “Flux Stone” to “Yes”. Flux stone is one of the ingredients you need to make steel so we really do want it. Set “Aquifer” to “No” unless you want to play with pumps and like a challenge. Set “Magma Pipe” to “Yes”. You can try setting any of the three options below to “Yes” as well, but there might not be a site that matches, so for now, leave them and hit “Enter” for “do search”. DF will now look for a location matching your preferences. Now, I’ve chosen the particular settings above to set up a fairly straight forward fortress location. You can have a lot of fun by not going for some of these settings, so don’t be afraid to experiment. Check the big comment at the bottom of the tutorial for more ideas on this by commenter Benkyo. Once the search is run a suitable site will be found (hopefully) and the local map will be centered on it. Hit “space” to back out of the find menu. Here’s what I’ve found. You can see the climate looks quite good. The temperature is warm, it’s got lots of wood. It’s wilderness, which will be somewhat challenging and fun and there’s some sand too – always nice if you want to make glass. However, one thing I don’t see is any flux stone…. or do I? Flux stone shows up white on the side info box normally, and you’ll recall I set the preferences to include it. Perhaps it’s in another biome? biomes are how land is divided up in DF. Plains will be one biome, a mountain range another, a forest yet another. Clearly there’s a forested biome here, and there are two options next to “View Biome”; “F1” and “F2”. By default we’re viewing the biome that dominates this space inside the local embark box and this is the “F1” biome. 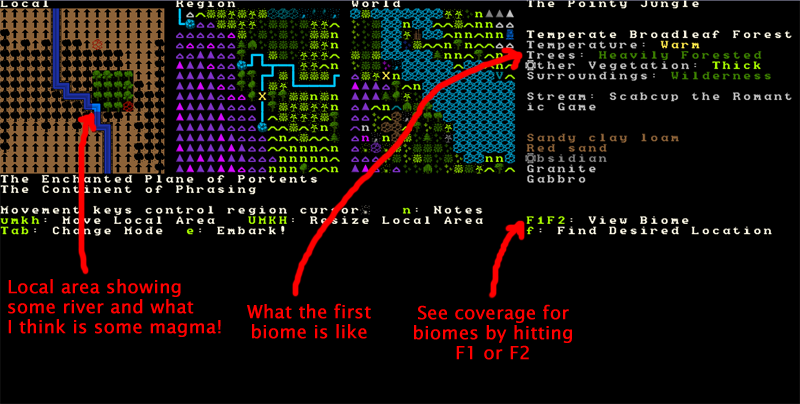 if I hit “F2” I will switch to seeing what’s on the other biome as well as what land it covers. The flashing Xs show the boundary and I can hit “F1” to see how it compares to the other biome. Here’s what I see when I check the second biome. Note, it’s possible to have three or even four biomes all intersecting on the area you’re looking at embarking to! The sharp eyed among you may note that it looks like no green X is covering my start area. I think what’s happening is that the red magma bit isn’t flashing, although it should be as it’s part of the “F2” biome. Perhaps it was me fiddling with the ini file recently that made this so. Oh, also, when you go through the world generation process you may not actually see any indication on the map that there’s magma in your starting location. But if you’ve set Magma Pipe to “Yes” and “Find” has worked then you know it will be down there somewhere. There are ini edits which change how visible certain features are in the world creation screen, to go into more detail might offer spoilers so you can go research it yourself if you fancy! I’m pretty pleased with that! A good sized area, a water source in the corner (you need water), magma, sand, flux stone, lots of wood, perfect! Of interest is that I have a stream instead of a full river (DF tells me that in the info box to the right of the maps) which somewhat reduces the difficulty of dealing with the challenges of water pressure and carp! I am now ready to embark! The best option, if you want to play straight away, is to select “Mayday Universal” and hit enter, you will now be taken to another menu which you want to hit “e” from. Voila! You’re in and playing! Alternately, you can “Prepare for the journey carefully” and individually skill and equip each dwarf. We’ll cover that some other time. Righto, that’s all for now. You should be able to do basic world construction to your heart’s content now. World generation is as complex as you want it to be and you can see some of those options under “Design world with new parameters” from the main menu. Don’t worry about those unless you get super keen on custom building worlds to ensure certain features, in which case, head off to the Bay12 forums already! There are lots of useful threads there and links to map databases (and info on how to use them). It’s a hobby in itself and people seem to enjoy competing to create the most perfect starting location or the most perfect micro-fortress. Thanks for your time and see you again in the future for custom party creation! Well done! I look forward to your discussion on embarking. Awesome! Thanks so much for posting this. I have to take issue with the advice you give on selecting a location. Why should magma, flux and rivers be required for early fortresses? It makes a lot more sense to me to select your location based on what you can see without the finder, and even to try and locate your fortress in the first randomly(?) selected region you begin at. My first fortress died a fiery death to demons, the second is currently prospering despite having a) no iron source b) no river, just a brook and c) no magma that I know of. There are so many ways to get around those issues that prescribing a guaranteed set of conditions for a fortress seems contrary to the spirit of the game. Isn’t variety more interesting? Isn’t magma a resource that deserves to be treasured for its rarity? Isn’t failure so much more interesting than success? Anyway, that’s what I reckon, I’m interested in what others think. You raise some really good points! I’ll edit the article a bit and I’ll tell folks to come down here and read the comments as well. That being said, a lot of newer players feel more comfortable if they don’t have to worry about any surprises in their first few games. Once they are confident they will spread their wings and try more challenging and interesting environments I figure. I have to agree with Mr. TinyPirate here. When I first tried to play DF about a year or so ago I felt like I was adrift in a sea of unknown terms and names. Because of this, I meandered around wasting time untill my forts would either starve or die of thirst. So while I agree with you that starting without things such as flux material and magma would certainly make the game more challenging and fun for an experienced play, please try to remember that this is the “Complete and Utter Newby Guide for Dwarf Fortress” and that most people who are reading this have not reached your supreme and transcendental level of Dwarf fortress knowledge and expertise. In fact, without these starting components at a fort site many a player’s fort would crash and burn in an inferno of failure. And nobody wants that. /random, I myself used Tinypirate’s excellent guide to start my own first fortress very recently. That was my first fort, abandoned because I finished the tutorial. The second fort fell to demons and my third is doing fine as I already mentioned. There’s no need to be sarcastic just because you disagree with my opinion. While we are both arguing from very individual and subjective positions, I suspect that most early forts get abandoned from vague feelings of dissatisfaction with the layout, and/or minor mistakes that a new player feels are more significant than they really are. There’s not really any need to provide a perfect location for your first fort. In fact, if you use up the best locations on forts you might abandon soon anyway what’s left? Military reclamation or erasing all that hard-fought history for a new world. Trees, water and temperate weather can all be found easily without the Finder, and so can iron and flux if you want them. In my own experience, bronze is a perfectly adequate substitute for iron for most of the game, and now after trading with caravans and looting goblins I have more iron and steel than I can use anyway. So anyway, from this complete beginner’s perspective flux and magma are not essential for early forts. Whether or not rivers, trees and warm weather are essential I can’t yet say. Ohh I’ve been doing fine on my treeless map in the mountains! Other than, you know, wood being the only things beds can be made from. Also a lack of coke/charcoal because I’ve found no bitumous coal/lignite. But trading is bringing me in tonnes of wood, for dirt cheap. Also I’m making my own fungiculture caverns, those young tower caps are springing up nicely. Rivers? No, not essential. Water? Yes, very very very essential. And that means potable water, not brine. Trees can be grown underground? That I didn’t know… do they count against elven logging agreements I wonder? Bloody Elves, I’ve probably annoyed my lot as the last trade caravan they sent got “accidentally” catapulted off of a drawbridge and into some lava. The goblin ambush didn’t help either. Did I miss a section on water sources? My dwarves go far to the south end of my fortress zone to drink from the river, which is quite inconvenient. I’ve heard you can make wells – is there any good info on bringing water closer to your fortress or whatever? Dwarfs without booze will drink water. Wounded dwarfs need to be brought water in a bucket. For this a dwarf needs to go fetch the water, a dangerous job as we know! Not so dangerous if you build a raised platform above a water source and put a well on that, my dwarves happily use my well to draw up water from an underground river that’s full of snakemen. Saves me from having to murder them all at least. Also booze cannot be emphasised enough, every dwarf from the eldest to the newborn needs booze to get through the working day, if they only have water they’ll be slow and ineffective. There is no place for sobriety in a Fortress. Your guide has been a great help so far. I think I could use some pointers on well construction though. thanks so much for your tutorials! i really enjoyed reading them, you should definitely continue writing them! im lovin this guide. it was written so long ago and it’s still incredibly relavant. @benkyo for me a more successful surviving fortress is much more interesting than a failed fortress. only because this game is so incredibly complex. i need to figure out how to do everything, and i cant do that if i lose my fortress in the first 5 years! heres to many more dwarves! How do you switch between candidates with the Find tool? I remember reading it somewhere, but I can’t find it. Good question – I don’t recall. Sometimes I just hit find again.